LG Genesis has made official today by US Cellular, It is an attractive dual-touch screen, sideways clamshell that is designed with a stylish QWERTY keyboard. It is running on Android 2.2 Froyo platform same as of HTC Thunderbolt 4G phone. It has 3.5 inches main display while that of secondary display is of 3.2 inches. LG Genesis is packed with a 5 MP snapper that you also get in Huawei Ascend X. The fast speed connectivity is made possible through Wi-Fi with mobile hotspot. The memory expansion option is available in this handset as well in the form of 32GB of eternal storage .It comes with an 8GB card. 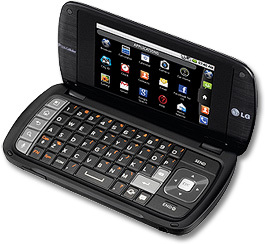 LG Genesis will land at US Cellular on 9th June with price tag of $149.99 and with a new two-year contract after rebate. You can also place an order for HTC Merge World Phone at U.S. Cellular. It will go on sale from June 9 for $149.99.